What the GOP is doing to our western neighbors they did to the South in 1860, and are doing to all of us likewise again from DC! With the Republican embrace of Cliven Bundy softening as soon as he offered his controversial views on the state of African Americans in the US, the Nevada rancher has decided to switch his allegiances. As RT has reported in the past, over the last two months Bundy has been involved in a growing dispute with the federal government over land rights. The Bureau of Land Management claims it’s been over 20 years since the rancher paid the fees associated with allowing his cattle to graze on public land, meaning he’s amassed an overdue bill of roughly $1 million. Bundy, however, does not recognize federal authority over public land, and argues that he doesn’t owe the government anything for using what his family had operated on since the late 1800s. 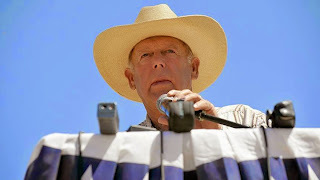 The situation came to a head when BLM agents attempted to seize Bundy’s cattle, prompting the rancher’s supporters – which included armed militia members – to come to his defense and initiate an armed standoff with federal agents. The cattle were eventually returned in order avoid escalation. Bundy was praised by some Republicans for standing up to what they saw as government overreach, but the goodwill faded quickly when the rancher wondered aloud to a reporter whether African Americans were better off as slaves. As noted by Raw Story, the IAP has endorsed David Lory Van Der Beek in his race to be Nevada’s lieutenant governor. Van Der Beek believes “terrorist attacks and mass shootings are government-backed false flag organizations,” and staged a faux, videotaped debate with a cardboard cutout of Nevada’s Republican Governor Brian Sandoval, in which he defended Bundy’s claim that he’s not beholden to the federal government.